Looking for a gift that both you and your baby will enjoy? Well Blooms for Baby, online at BloomsforBaby.com, is the place for you. This store makes baby garments a fun gift by arranging them in bouquets with silk and paper flowers and leaves. Blooms offers handcrafted garment sets for you baby girl, baby boy, “I Don’t Know Yet” baby, and products for big brothers and big sisters in children’s clothing sizes. Blooms baby’s and kid’s apparel is made by top brands including Mudpie, Carter’s, Dr. Seuss, Gymboree, Disney, and many more. For incredible Blooms for Baby promotions, Blooms for Baby discounts, and Blooms for Baby coupons, check out RetailSteal.com. 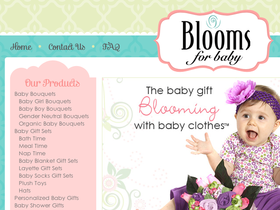 Blooms for Baby guarantees 100% satisfaction on all orders. Packages ship through UPS at approximately $10 per bloom when order destination is within the 48 lower states of the United States. Blooms does not ship internationally at this time. See website for details and shipping rates. Use this coupon code during the spring season and receive free shipping on all orders of $60 or more.